There are few footwear options that exist in both the minimal and trail running space. Hosting one of these two benefits is common, with duality becoming a rare feat. Altra has accomplished this task with their creation of the Altra Superior 1.5 Trail Runner. This shoe combines the low-profile functioning of a minimalized shoe with the durability to stand up to coarse terrain. There are many component pieces that go into this process, so detailing them becomes a necessity. Below is an in-depth review of this model. We'll piece out the parts and describe the function behind each item. 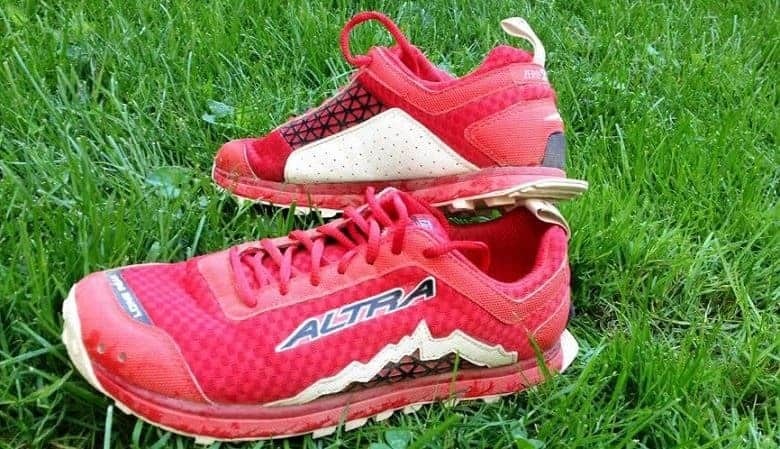 Creating a shoe that is both minimal and offers assistance to the off-road space is difficult, but Altra has accomplished this with their Superior 1.5 model. The layering of materials and functions located at the midsole and outsole represents an area to key-in on. This helps increase the support, comfort, and durability of the shoe. This also marks the location where minimalized function meets off-road adventures. The additional inclusions at the upper also create the positive reinforcement needed to endorse this lightweight option as a success in the off-road space. Check Price on Amazon! Trail running shoes often offer up thick outsoles, with reinforcement measures used as often as possible. These shoes rely on strength and durable build to combat pressures, coarse surfaces, and rough terrain. This requires a sound build that takes from multiple resources in the material makeup. This build-up often finds solace at the outsole, due to its operating properties as a base. This offers the structural component for adding materials. Minimalized shoes, or shoes that keep your foot close to the ground, often rely on less materials for success. They are termed minimalized due to the height between foot and ground. Less elements are called for in this process, due to the minimal height you wish to gain. The outsole of a minimalized shoe is often thin. To combat both of these forces, Altra targeted the outsole, undercarriage, and insole as their three areas for success. The outsole remains thick, rising about an inch into the outer shell from the ground. It has two layers, one to reach the undercarriage and one that operates as the midsole. The undercarriage offers a third layer, housing grippers that extend to the ground. This area is coarse and grooved, which helps cater to the surfaces you come across. The insole is set deeply into the shoe, which helps attain the minimalized feel. It sits close to the undercarriage, allowing you to have little space between foot and ground. If you have sampled from the Altra product line at a previous time, you understand the notion of a natural fit and design. The natural fit is prescribed to cater to the average foot. The prescribed means pay close attention to the arch, the heel area, and the toe box. It is widened and narrowed at these areas to meet these average sizing requirements. With this being said, the user with probably want to bump up half a size to make up for these features. This will help the user gain a little more space. The sizes do range to different widths, extending the reach to most of the footwear marketplace. The outsole is made up of synthetic materials, which is important to the lightweight and minimalized notions. This material weighs much less than rubber and is often more flexible than rubber. It works to cater to the natural flex of the foot. The undercarriage meets the outsole and includes a thin layer of rubberized material. This layer is met with extended grooves and grippers that help with the trail running space. The outsole is made up of three different layers: the synthetic material, the thin rubberized layer, and the extended grippers at the undercarriage. These elements are fused together and remain thin, allowing for the minimalized build. The midsole is stacked on the top layer of outsole and is also made of synthetic materials. This element extends from toe box to heel, creating the even base needed in this area. It caters to all areas of the foot, providing cushioning and even performance standards. Internally, the midsole is layered with two fixings of the EVA material. This material is resistant to shocks, helping to absorb pressures and limit this stress on the foot. This dual layer also provides reinforcement of these means, ensuring their success over the course of a long-distance trek. The upper is also constructed from synthetic material, but features additions to implement proper holding and ailment. The insertion point of the upper is widened for easy access. This area can be locked down with the proper lacing, keeping the proper grip and support at the ankle area. This model features Altra's famed Natural Ride System. This feature starts at the back of the shoe and wraps to the upper area at the laces. This system keeps the sides of the foot aligned properly, reducing any side-to-side movements and implementing proper posture. The wide tongue keeps the top of the foot secure, producing a second instance of lockdown support. Due to the main construction element extending from synthetic materials, this shoe remains lightweight. The total weight comes in just over 8 ounces, which is a feat to behold for a trail running shoe. The trail running space often deals with bulky offerings to cater to rough surfaces, increasing the total weight of the product. 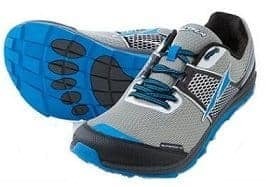 Altra has found their groove in design and have created a lightweight option that hosts usage in off-roading adventures. The main uses of a trail runner take you to new heights and new paths. The foot is under a constant heat wave during these movements, calling for the proper breathability measures. The first instance of inclusion occurs at the outer shell. A honeycomb design is greeted with small holes. These small holes allow for positive air flow. The necessary air reaches the foot and the excess is allowed to escape. The other area of air escape is located at the upper. The insertion point is wide, and the collar of the shoe features a padded overlay. Together, these two components work to infuse the air flow process. The comfort is emitted primarily from the midsole. This dual-layer function doubles the use of cushioned material and even-keeled patterning to keep your foot from excessive pressures. These pressures are absorbed in this area. The second area of comfort is created through the proper undercarriage design. They rubber layer resting on top of the grippers help reduce shock and keep the notion of an even base for footing. The toe box is spacious, which limits the pressures placed on the toes. The insertion point also allows for you to create the proper holding pressure on the ankle. The user is left will full control over the amount of emitted comforts. The durability starts at the outsole and extends to the upper. The outsole houses three different layers of material. Within the midsole, there are two separate comfort layers, increasing the total reinforcement provided at the outsole area. This creates a wall of forces that prevent breakdown of both the foot and the materials used. The upper houses the Natural Ride System which helps reduce cave-in at the ankle and heel area. The GaiterTrap at the heel also produces the proper shank to keep you upright and reduce element wear. The primary surfaces for intended usage revolve around the outdoor space. Coarse terrain is met with the proper gripping via the extensions included at the outsole. This makes trails and uneven surfaces fair game for use. StoneGuard protection is also included for conquering rocky surfaces. This allows you to conquer mountainous areas or areas with rock extensions. The smooth and flat surface is also fair game due to the minimalized fit. This allows you to develop the proper strides. The stability piece starts at the back-heel area. The GaiterTrap reduces ankle roll and keeps you in the proper, upright positioning. This shank also works to reduce shock and absorbs these pressures with each push-off. The even patterning introduced at the midsole and the outsole also creates for a flat base. This is important for emitting the proper movement from the foot and to keep your movement both fluid and stable. The synthetic design makes for the proper flex of the foot. The foot should be allowed to emit natural flex, which is a function that can be achieved with this model. The synthetic material is very forgiving, allowing the user to perform natural movements and reducing the notion of robotic functioning. The minimalized natural also allows you to provide your natural pressures on push-off and landing. This is important for proper stride development and finding the correct footing, no matter the surface. The primary use would be for trail running. This space allows you to apply all of these mentioned features, with the benefits catering to proper stride development, push-off, and foot striking capabilities. They can also be used for rock climbing and scaling coarse terrain. The properties included make any canvas the proper fit for the user. With Altra holding such an implied fit, it is important to stick within this brand for product alternatives. Other brands will implement different measures for sizing and fits, leaving Altra in its own space. Two shoes that gives similar design and function is the Altra Men's Lone Peak 3 and the Altra Women's Lone Peak 3. This is the third extension from the Lone Peak model line, which creates for implied measures in design. The outsole is made from rubberized components, which differs from the Superior 1.5 and the synthetic usage. This gives the shoe a little more weight than the Superior. This model features a re-designed upper, which increases the means of support, stability, and holding. The EVA midsole is designed with the same dual layer, which is important for increasing the comfort and cushioning on the foot. This model isn't minimalized like the Superior 1.5. The third model that matches closely with the Superior 1.5 is the Altra Timp Trail Running Shoes. These shoes feature a similar mold, with the ZeroDrop technology to bring the user close to the running surface. The outsole features an enhanced design, known as MaxTrac technology. This area maps the pressure points of the foot and creates extensions to relieve these pressures. The outsole is made of thick rubber, which is a feature not associated with the Superior 1.5 model. When it comes to shoes, Brandon is our expert! He currently works in a department store as a supervisor/lead position for the shoe department. The department works with anything from athletic shoes to work boots, so he has experience in all sorts of shoe types. His strong suit is athletic shoes, utility shoes (tactical boots, work boots, kitchen shoes, nurse shoes), and other sport shoes. He verses himself in the many varieties and brands on a weekly basis, as they obtain about 30-50 new styles every week. This helps to strengthen his product knowledge and give important insight to customers that aren’t necessarily sure what types of shoes they need. Also, he is a big fan of tennis. He practices it regularly and his knowledge level regarding tennis equipment is very high.